If you took high school chemistry, you learned that water is created when two gases, hydrogen and oxygen are combined. You may have even been lucky enough to have a teacher who was able to perform this magical transformation live during class. Depending primarily on the amount of heat energy absorbed, water exists in one of the three states of matter, gas, liquid, or solid. Its states also depend on surrounding atmospheric pressure, but more about that later. For our discussion, the water will reside at the atmospheric pressure present at sea level, which is around 14.7 pounds per square inch. Last time we learned that the heat energy absorbed by water before it begins to boil inside our example tea kettle is known as sensible heat within the field of thermodynamics. The more sensible heat that’s applied, the more the water temperature rises, but only up to a point. The boiling point of water is 212°F. In fact this is the maximum temperature it will achieve, no matter how much heat energy is applied to it. That’s because once this temperature is reached water begins to change its state of matter so that it becomes steam. At this point the energy absorbed by the water is said to become the latent heat of vaporization, that is, the energy absorbed by the water becomes latent, or masked to the naked eye, because it is working behind the scenes to transform the water into steam. As the water in a tea kettle is transformed into steam, it expands and escapes through the spout, producing that familiar shrill whistle. But what if we prevented the steam from dispersing into the environment and continued to add heat energy? Ironically enough, under these conditions temperature would continue to rise, upwards of 1500°F, if the stove’s burner were powerful enough. This process is known as superheating. Now hold your hats on, because even more ironically, the heat added to this superheated steam is also said to be sensible heat. Confused? Let’s take a look at the graph below to clear things up. Sensible heat is heat energy that’s added to water, H2O, in its liquid state. It’s also the term used to describe the heat energy added to steam that’s held within a captive environment, such as takes place during superheating. On the other hand, the latent heat of vaporization, that is the heat energy that’s applied to water once it’s reached boiling point, does not lead to a further rise in temperature, as least as measured by a thermometer. Next time we’ll see how surrounding air pressure affects water’s transition from liquid to steam. 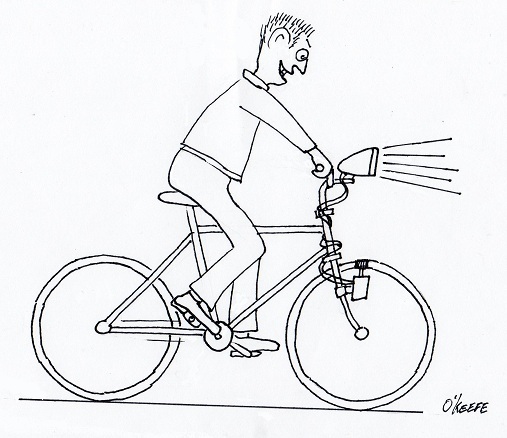 When I was a kid I remember how cool it was to have a headlight on my bike. Unlike the headlights that the other kids had, mine was not powered with flashlight batteries. The power came from a little gadget with a small wheel that rode on the front tire. As I pedaled along, the tire’s spinning caused the small wheel to spin, and voila, the headlight bulb came to life. Little did I know that this gadget was a simple form of electrical generator, and of course I was oblivious to the fact that a similar device, albeit on a much larger scale, was being used at a nearby power plant to send electricity to my home. Over the last few weeks we learned how a coal fired power plant transforms chemical energy stored in coal into heat energy and then into mechanical energy which enables a steam turbine shaft to spin. We’ll now turn our attention to the electrical generator. It’s responsible for performing the last step in the energy conversion process, that is, it converts mechanical energy from the steam turbine into the desired end product, electrical energy for our use. It represents the culmination in energy’s journey through the power plant, the process by which energy contained in a lump of coal is transformed into electricity. To show how this final energy conversion process works, let’s look at Figure 1, a simplified illustration of an electrical generator. You’ll note that the generator in our illustration has a shaft with a loop of wire attached to it. When the shaft spins, so does the loop. The shaft and wire loop are placed between the north (N) and south (S) poles of a horseshoe magnet. It’s a permanent magnet, so it always has invisible lines of magnetic flux traveling between its two poles. These magnetic lines of flux are the same type as the ones created by kids’ magnets, when they play with watching paperclips jump up to meet the magnet. The properties of magnets are not completely understood, even to adults who work with them every day. And what could be more mysterious than the fact that as the shaft and wire loop spin through the lines of magnetic flux in the generator, an electric current is produced in the wire loop. Now, this current that’s flowing through the spinning wire loop is of no use if we can’t channel it out of the generator. The wire loop is spinning vigorously, so you can’t directly connect the ends of the loop to stationary wires. A special treatment is required. Each end of the loop is connected to a slip ring. A part called a “brush” presses against each slip ring to make electrical contact. The electrical current then flows from the loop through the spinning slip rings, through the brushes, and into the stationary wires. So, if, for example, a light bulb is connected to the other end of the stationary wires, this completes an electric circuit through which current can flow. 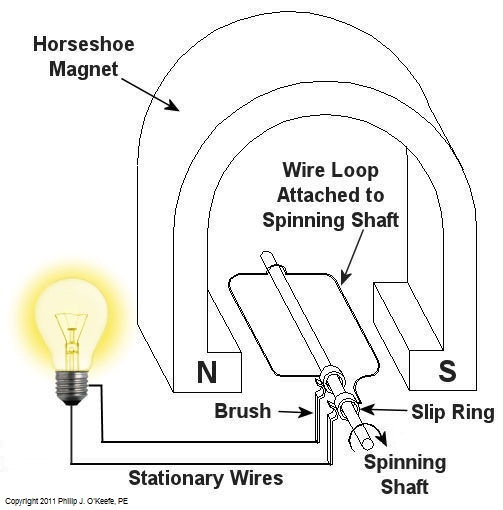 The light bulb will glow as long as the generator shaft keeps spinning and the wire loop keeps passing through the magnetic lines of flux from the magnet. So we see that the key to the whole energy conversion process is to have movement between magnetic lines of flux and a loop of wire. As long as this movement occurs, the electricity will flow. This basic principle is the same in a coal fired power plant, but the electrical generator is far more complicated in construction and operation than shown here. My Coal Power Plant Fundamentals seminar goes into far greater detail on this and other aspects of electricity generation, but what I have shared with you above will give you a basic understanding of how they operate. That concludes our journal with coal through the power plant. This series of blogs has, you will remember, presented a simplified version of the complex material presented in my teaching seminars. Next week we’ll branch off, taking a look at why electrical wires come in different thicknesses. There is perhaps no greater act of denial in modern life than sticking a plug into an electric outlet. No thinking person can eat a hamburger without knowing it was once a cow, or drink water from the tap without recognizing, at least dimly, that its journey began in some distant reservoir. Electricity is different. Fully sanitized of any hint of its origins, it pours out of the socket almost like magic. 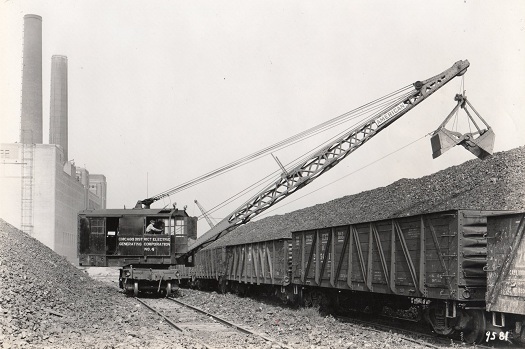 A locomotive crane unloading coal from railcars at a power plant in the late 1930s. Next week we’ll continue our regular series, following energy’s journey through the power plant. When I was a kid I didn’t have video games or cable TV to help me occupy my time. Back then parents tended to be frugal, and the few games I had were cheap to buy and simple in operation, like the plastic toy windmill I’d play with for hours on end. All I had to do to make it spin was take a deep breath, pucker my lips together, fill my cheeks with breath, then blow hard into the windmill blades. Its spin was fascinating to watch. Little did I know that as an adult I would come to work with a much larger and complex version of it, in the form of a power plant’s steam turbine. You see, when you trap breath within bulging cheeks and then squeeze your cheek muscles together, you actually create a pressurized environment. This air pressure buildup transfers energy from your mouth muscles into the trapped breath within your mouth, so that when you open your lips to release the breath through your puckered lips, the pressurized energy is converted into kinetic energy, a/k/a the energy of movement. The breath molecules flow at high speed from your lips to the toy windmill’s blades, and as they come into contact with the blades their energy is transferred to them, causing the blades to move. A similar process takes place in the coal power plant, where steam from a boiler takes the place of pressurized breath and a steam turbine takes the place of the toy windmill. 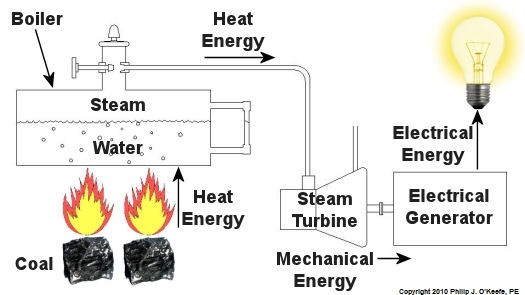 If you recall from my previous article, the heat energy released by burning coal is transferred to water in the boiler, turning it to steam. 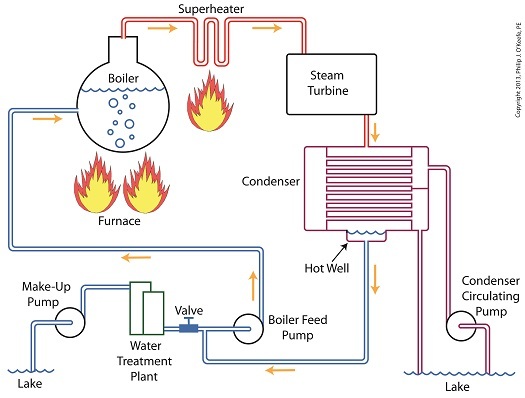 This steam leaves the boiler under great pressure, causing it to travel through pipe to the steam turbine, as shown in Figure 1. At its most basic level the inside of a steam turbine looks much like our toy windmill, of course on a much larger scale, and it is very appropriately called a “wheel.” See Figure 2. The wheel is mounted on a shaft and has numerous blades. It makes use of the pressurized steam that has made its way to it from the boiler. This steam has ultimately passed through a nozzle in the turbine that is directed towards the blades on the wheel. 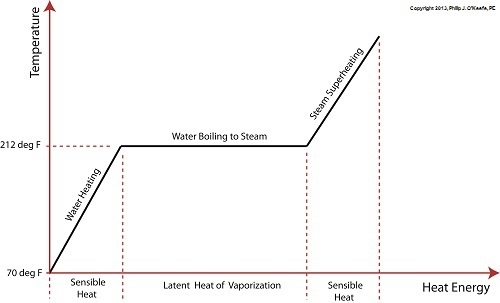 This is the point at which heat energy in the steam is converted into kinetic energy. 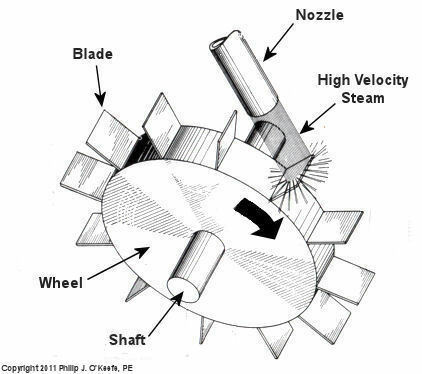 The steam shoots out of the nozzle at high speed, coming into contact with the blades and transferring energy to them, which causes the turbine shaft to spin. The turbine shaft is connected to a generator, so the generator spins as well. Finally, the spinning generator converts the mechanical energy from the turbine into electrical energy. In actuality, most coal power plant steam turbines have more than one wheel and there are many nozzles. The blades are also more numerous and complex in shape in order to maximize the energy transfer from the steam to the wheels. My Coal Power Plant Fundamentals seminar goes into far greater detail on this and other aspects of steam turbines, but what I have shared with you above will give you a basic understanding of how they operate. 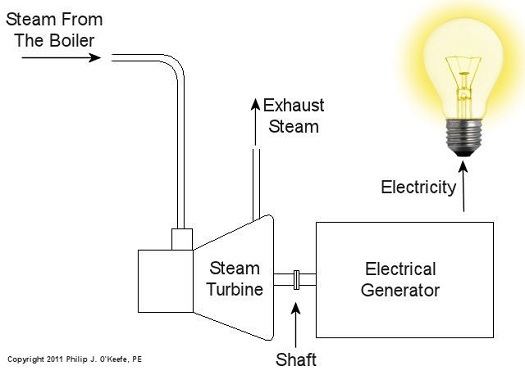 So to sum it all up, the steam turbine’s job is to convert the heat energy of steam into mechanical energy capable of spinning the electrical generator. Next time we’ll see how the generator works to complete the last step in the energy conversion process, that is, conversion of mechanical energy into electrical energy. 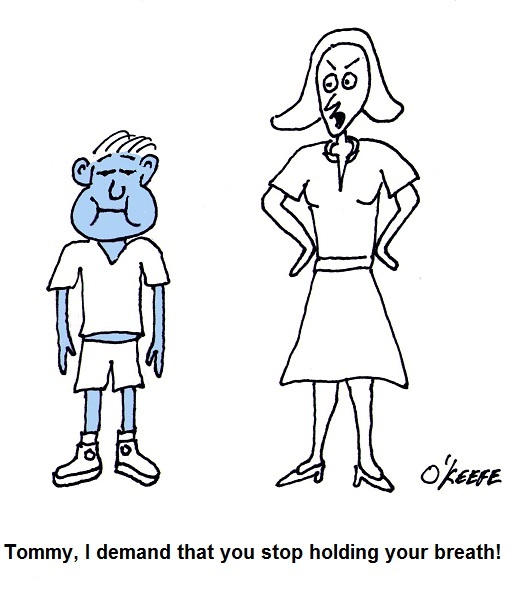 Ever have a small child threaten to hold his breath until he passes out and he actually managed to do it? It’s not that unusual. And if his body were prevented from acting in self preservation, that is, taking in breaths while he was unconscious, leading to his eventual awakening, he would die. While the human body can survive about a month without eating and three days without water, under normal conditions it can survive only a matter of minutes without breathing. Power plants, too, require oxygen to function, and this process is called combustion. Human lungs, along with the diaphragm which works to expand and release the lung cavities, enable our bodies to breathe in air, then expel the waste product, carbon dioxide. Oxygen is needed to metabolize, that is burn, our food, enabling the food cells’ energy to be absorbed by our bodies and converted into energy to live. Like us, coal power plants need to breathe in oxygen in order to convert coal’s latent energy into a usable form. Previously we learned how coal is fed to a coal mill where it is pulverized into a fine powder. This powder is then sucked out of the mill by the exhauster and blown through a serpentine path of pipes leading to the burners on the furnace. The burners will then act upon the coal, combining it with the oxygen in our atmosphere to create a chemical reaction capable of releasing coal’s energy in the form of heat. All this activity looks to a bystander like a massive, sustained fire in the furnace. 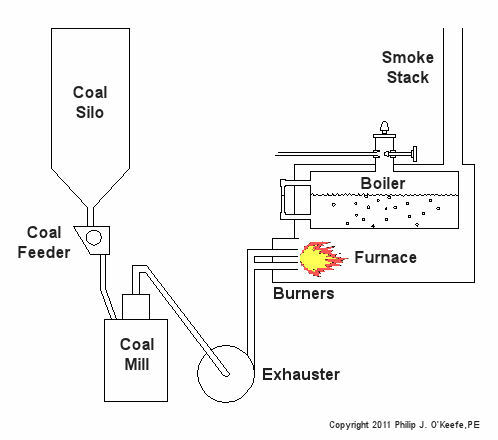 See Figure l.
The boiler is contained within the furnace and is situated so it is exposed to fire from the combustion process. Heat energy from the fire transfers into the water in the boiler, much like when you boil water for tea in a kettle on your stovetop. If you’ve ever boiled water, you know that once it gets hot enough it will turn into steam, and the same for our furnace boiler. The steam emitting from the boiler will cause a turbine-generator to spin, and the end result will be electricity for our use. 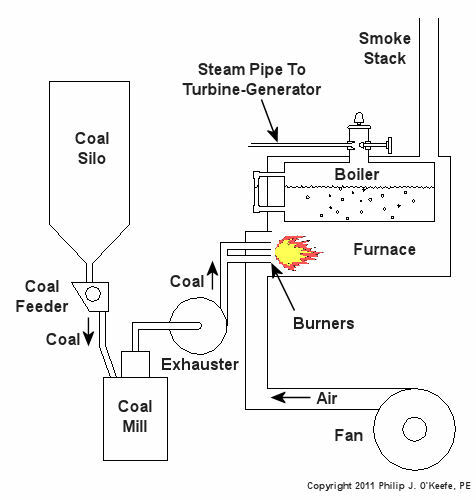 In the simple diagram of Figure 1, waste products from the combustion process, like carbon dioxide, go up the smoke stack and are released into the atmosphere. Incidentally, this is the same type of carbon dioxide that we exhale from our bodies when we breathe. Please keep in mind that Figure 1 is a very simplified diagram. In reality waste products leaving the furnace go through various pollution control devices where most pollutants are removed before they reach the smoke stack. These details, and many more, are the type of information that would be covered during my training seminar, Coal Power Plant Fundamentals. Next time we’ll learn how the heat energy in steam is converted into mechanical energy capable of spinning a turbine generator to make electricity. Several years ago I was asked by power producers within the electric utility industry to write and then present a training course on the subject of coal power plant fundamentals. The finished product was a two day introductory course on the energy transformation process within a coal fired plant. Since that time my seminar, entitled Coal Power Plant Fundamentals, has been presented to a variety of audiences, including Mirant Corporation, Platte River Power Authority, and Integrys Energy Group, Inc. Audience makeup has been diverse and has included equipment manufacturers, mining companies, power industry consultants, and regulatory agencies. This seminar, which I continue to present today in meeting rooms across the country, covers all major systems in a typical power plant, from coal handling when the coal first enters the plant, to its eventual end destination, the electrical switch yard which facilitates power transmission to customers. My Power Point presentation is embellished with ample illustrations, including photographs that I have taken during the course of my career and diagrams which I created using CAD, or Computer Aided Drawing software, one of which is featured below. In addition to the overhead slides, I provide a 150-page bound book which is distributed to seminar attendees. They use it to both follow along with my lecture and have a source of refresher material to take home with them. I’ve been told that having my illustrations in front of them makes a world of difference towards their understanding of the subject matter. The unique thing about my course is that it focuses on the simplified presentation of complex engineering concepts, much like my blogs do. Of course it always helps to have an engineering background or scientific background of sorts, but I wrote the course to accommodate understanding of the subject matter by individuals without any technical background. Accountants, salespersons, administrative staff, plant operating and maintenance workers, and journalists have all found the course to be easy to follow, interesting, and informative. 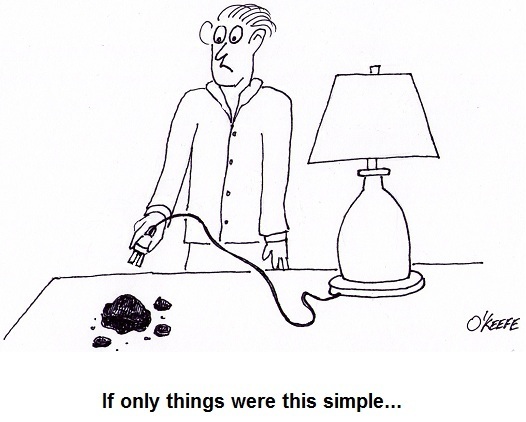 So how do you get electricity from coal? To answer this question and give you a sampling of my seminar material let’s take a look at Figure 1. Following along from left to right, the coal is first burned in order to transform the chemical energy which it contains into heat energy. That heat energy is then absorbed by water inside a nearby boiler, where it is converted into steam. The heat energy in the steam flows through a pipe into a steam turbine where it is again transformed, this time into mechanical energy that enables the turbine shaft to spin. The mechanical energy in the turbine is then transmitted by its shaft, enabling it to turn an electrical generator. And, finally, the mechanical energy is transformed by the generator into electrical energy for our usage. Simple process, right? Well, maybe, maybe not. My illustration certainly helped to simplify things, but there are a lot of details that were purposely omitted so as not to “muddy the waters.” It’s those details which have the potential to make things a lot more complicated, and next week we’ll begin to take a closer look at some of them.